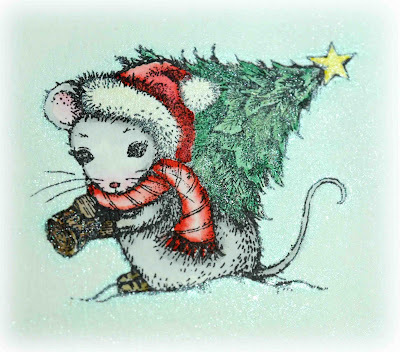 The stamp set I used on this card is called Christmas Tree Mouse. 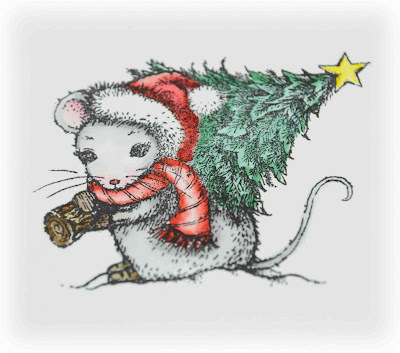 I just love this cute mouse and know it will be one of my favourites for this year's Christmas cards. 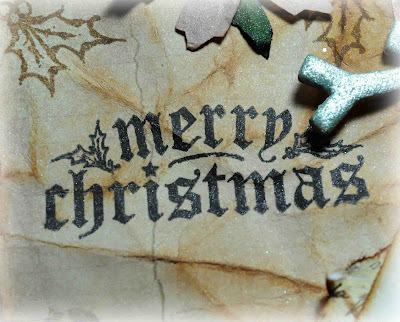 Christmas is the season of shimmer and glitter and I just love using shimmery products on the cards. And the Shimmerz works so well with this image. Here you see the image coloured with ink refillers, before I used some Shimmerz on it. And on this picture you see the image after I used Shimmerz on it! Double click the picture too see all the shimmery details;) Do you see the difference?!?! It's just amazing!! On the hat I used a little bit of Choc-o-lot. The star was painted with Candle Light and on the tree I used Green Olive. 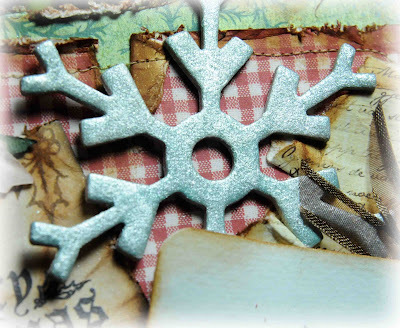 Around the image I painted twice with Mint to really make it sparkle a lot and to make an impression of the snow! 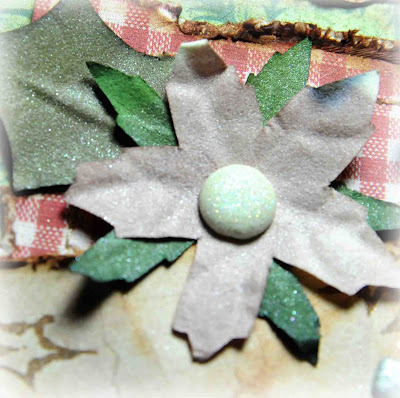 The snowflake chipboard was painted with Mint. When it was dry I sprayed with Shimmerz Spritz Babys Breath. The flowers and leaves are sprayed with Spritz Mudpie. 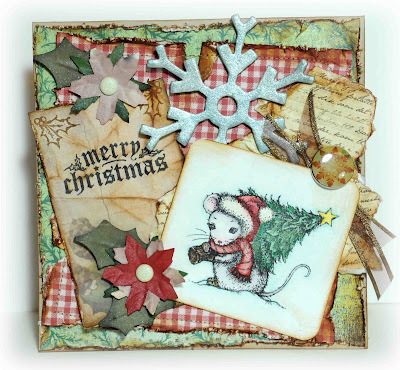 On this tag I used the text stamp and the holly from the stamp set. I sprayed it all with Spritz Mudpie. 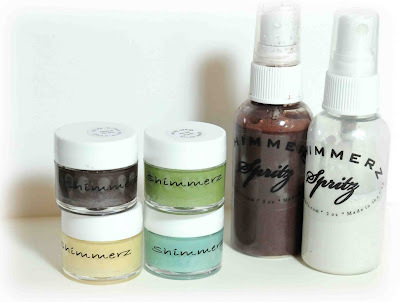 Here you see the different Shimmerz products I used on this project. What a sweet card! I love all the shimmery touches you gave it! This is gorgeous! I love everything that you did on this card!! What a totally beautiful Christmas collage! 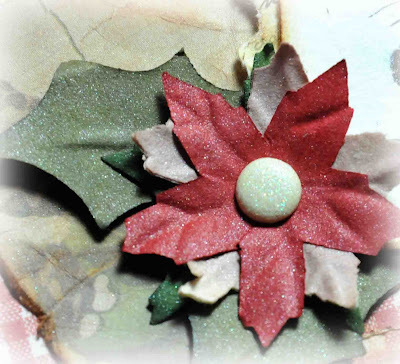 I love your embellishments and the shimmer is wonderful too, Kristine!